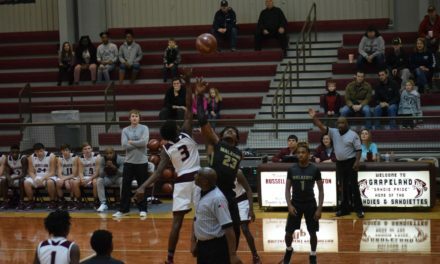 LOVELADY – It was Homecoming in Lovelady as the Lions welcomed the Burkeville Mustangs to town for both teams’ first District 12-2A DII game of the season. 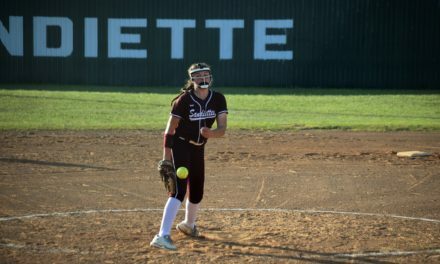 Lovelady came into the game with a record of 3-1 while Burkeville was 1-3. As the game got underway, Burkeville won the toss and deferred to the second half. In hindsight, the Mustangs should have received. The opening kickoff settled into the arms of Tre Hawkins at his own 30-yard line. Hawkins cut to his left, picked up several great, downfield blocks and went 70 yards for six points. The Lions decided to go for two and Lion QB Logan Lowery found Hawkins in the back of the end zone to make the score 8-0. 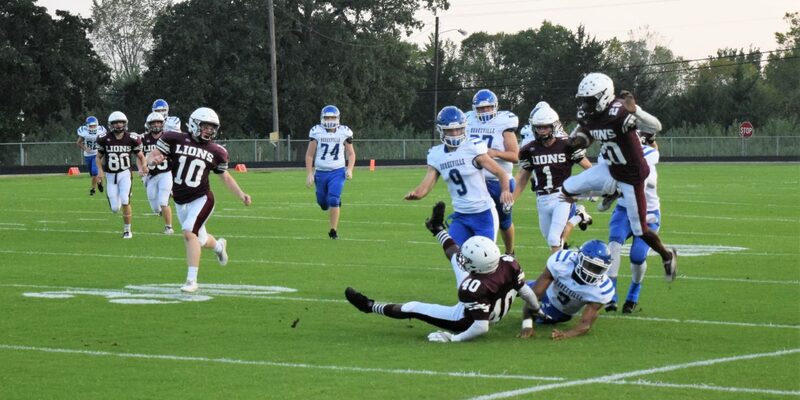 Lovelady kicked off but the Burkeville kick returner slipped as his attempted to catch the ball and the Lions pounced on it at the Burkeville 11. On the next play from scrimmage, Lowery found Michael Price for 11 yards and a TD. Once again, the Lions went for two and once again they made it to extend their lead to 16-0 as Timothy Johnson plowed into the end zone. Stop me if you’ve heard this before. On the ensuing kickoff, the Mustangs turned the ball over to the Lions with a fumble at their own six. The next snap saw Lowery connect with Jay Thomas Robinson for a Lovelady touchdown. 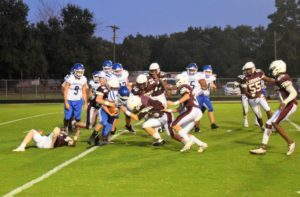 Johnson banged his way across the goal line – again – for two points and with only 37 seconds gone in the game, the Lions led by a score of 24-0. Things were about to get worse for Burkeville. After fielding the kickoff, the Mustangs started at their own 35. Disaster struck on the next play as the Mustang ball carrier fumbled after he was hit. 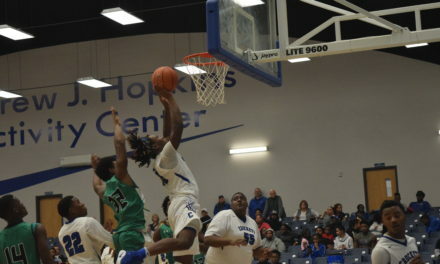 Deontrae Hawkins jumped on the loose ball and the Lions had possession at the Burkeville 28. Following the fumble, Lowery connected with TreVon Hawkins for 28 yards and Lowery’s third passing TD in under a minute. Tre Hawkins converted the two-point attempt and with 11:02 still to play in the first quarter, the Lions led 32-0. The Mustangs had only dressed out 12 players to start the game and on the Tre Hawkins two-point conversion, one of their skill position players was ejected. The ejection dropped the number of Burkeville players to 11 and the worst was yet to come. On their next possession, the Mustangs started at their own 15 and went backwards as Greyson Bachynsky sacked the Burkeville QB for a loss back to the six. Two more plays netted zero yardage and Burkville was forced to punt from their own end zone. 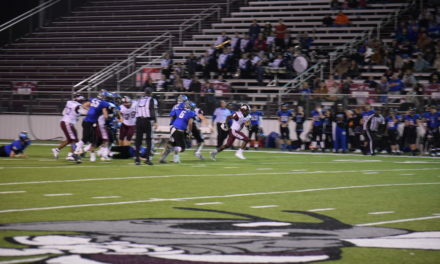 Lovelady’s Robinson fielded the kick at the Mustangs’ 25 and with a wall of blockers to his right, Robinson loped down the sidelines for a touchdown. Bachynsky blasted his way into the end zone for two and with 8:31 left in the quarter, Lovelady now led 40-0. The next time the Mustangs had the ball, they had it at their own 37 and lost four yards on three plays, forcing a punt. A good punt return brought the ball back to the Burkeville 37. From there, Bachynsky did the rest as he scampered through the middle of the line on his way to a 37-yard TD. Lowery connected with Seth Murray for the two-point conversion and with 5:17 left in the first, the Lions led 48-0. Believe it or not, things got even worse. After the kick, the Mustangs started at their own 27. On their first play, a pitch between the quarterback and running back was picked off by Logan LeBlanc who took the rock 27 yards to the house. Robinson knocked the extra point attempt through the uprights and with 4:10 left in the first, Lovelady extended their lead to 55-0. The Lions tacked on another touchdown on a 20-yard fumble recovery to bring the first quarter scoring to a close with the Lions in charge by a score of 61-0. 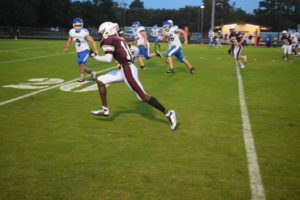 Robinson kicked a 24-yard field goal in the second quarter and added a second three-pointer in the second half to bring the final score to 67-0, in favor of Lovelady. The Lions will travel to Colmesneil on Friday, Oct. 5 to take on the Colmesneil Bulldogs. Kickoff is scheduled for 7 p.m.
It’s Tournament Time in Houston County! !